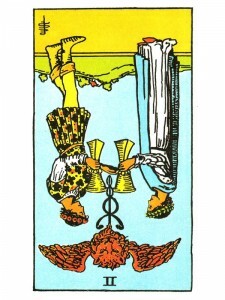 The Two of Cups (R) shares that you will need to control your emotions – you tend to become over sentimental and empathize with others so strongly that you forget whose feelings are whose. Control your urge to comfort and heal everyone you come in contact with. Disagreements and misunderstandings can cause a loss of balance in close relationships. It doesn’t matter who makes the first move – if you are too possessive or too demanding in a relationship – your own pride will destroy love. The protection of your “ego” is not worth the price you will have to pay. Accept that everything can not be perfect all the time and that an “all – or – nothing – at – all” attitude will deprive you of what you need. Become receptive to “limiting” feelings – allow yourself to feel deeply – transform any “limiting” feelings and maintain your inner balance. Think things over – put aside your anger and allow a new perspective to develop – deter anything which arises from undesirable external situations and allow your inner peace to radiate outwards. Try not to repress your emotions – learn to emotionally regenerate and revitalize yourself. Recognize that you are capable of experiencing great happiness even in the driest of times. Difficulty with recognition of an emotional choice or with identifying and partnering with that choice to make a fertile relationship. At the extreme there may be blockage preventing a beneficial merger, hindering a creative process or slowing the development of a talent. Divorce or the blockage of divorce in a relationship detracting from rather than adding to your emotional energy and creative resources. Infertility, sexual or creative. There may be an inappropriate forcing of a talent or relationship – marriage of convenience. Do you find that you are split between what you are doing and what you are really feeling? Are you split between action and emotion – simply going through the motions of love without any care or concern for the outcome? In the first position: The requirements needed for expansion through partnering and/or development of your special gifts may be very strong. Or, the karmic purpose will be to sort through the difficulties of emotional/creative choice and dedication. Assist in keeping love bonds strong and productive rather than destructive. In the second position: Too much or too little – a divorce or problems in marriage may be undermining your health or career. Or the opposite, too much attention and time involvement in your marriage or love partner may be hurting your work. An unhealthy pairing. In the third position: Permanence or condition of major relationship may be changing, may even need to change or it may be too strong and actually interfering with some other aspect which needs attention. You cannot live for a relationship alone, at the expense of all other people or issues. In the fourth position: At one extreme, these images may be to ideal or too fixed. Or, they may be faulty in some other regard, including being dominant yet weak models on which to build. In the fifth position: Realize ineffectiveness or over effectiveness, of your love match. Separation or divorce may be planned. Reconciliation under consideration if there has already been separation. May be putting much too much emphasis on your partnership, taking time and energy properly spent on additional things. Or, it could be the opposite of not enough emphasis. Could be against the idea of union altogether and strategizing how to avoid it. In the sixth position: Too much or too little – a relationship may be ending. In the seventh position: You must either take your present relationship in a new direction or you must back away form it all together. You might fear formal commitment or one – on – one relationships all together. Or, you might like the outer formality of marriage all too much, as a cover or protection – without inner commitment. In the eighth position: On the one hand, going overboard on courtship or marriage. On the other hand, not doing enough of the right things. Possibly the ending of an important sexual relationship, including divorce. Relationship not working in its present form or because of incorrect match. In the ninth position: The distortion here is complex. One extreme is the heart’s abandoning itself to an ideology that it is not in love with. In the tenth position: Radical change in or the ending of a formal relationship will be best if you want to honor your beliefs and realize your goals. Careful here; the divorce in question may be the one you have with an internal creative program that is not your main talent.